2005. Hand-pieced. 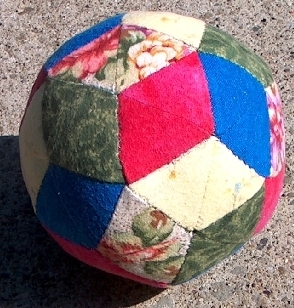 The book Patchwork Puzzle Balls by Jinny Beyer inspired these pieced balls. They're based on various polyhedra -- made from regular polygons. 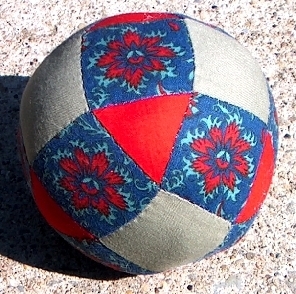 Patterns (called 'nets') for polyhedra can be found at Mathworld ( mathworld.wolfram.com). Stuffing the stitched polyhedra makes them into balls. equilateral triangles. 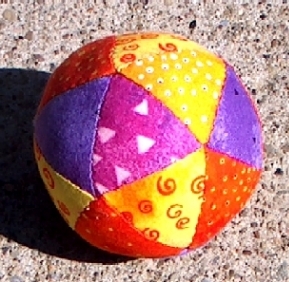 Dodecahedron. 4-inch diameter. Made of 12 pentagons. Truncated Octahedron. 5-inch diameter. Made of 8 hexagons and 6 squares. Made of 20 triangles and 12 pentagons. 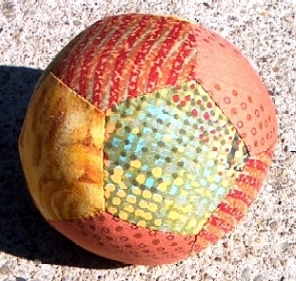 Rhombicuboctahedron. 4-inch diameter. Made of 18 squares and 8 triangles. 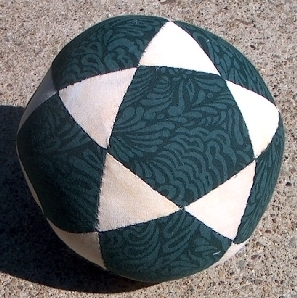 Rhombic triacontahedron. 5-inch diameter. 30 diamonds, Tumbling Blocks pattern. 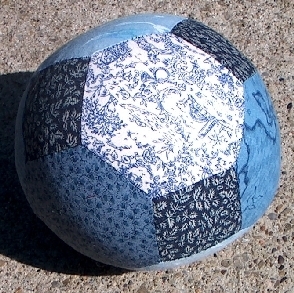 I used 60 flannel triangles to make this ball for the friend who supplied the fabric. I won't make that mistake again. Flannel is not tightly-woven enough to use for these balls.